Summary: According to a new study, clinically depressed children show a blunted response to reward compared to those who were not depressed. For many children, December often is linked to presents and excitement, but when a young child doesn’t seem all that enthused about getting gifts, it could be a sign that something is wrong. Measuring brain waves, researchers at Washington University School of Medicine in St. Louis have found that clinically depressed children don’t respond to rewards the same way as other children do. The new findings are published in the December 2016 issue of the Journal of the American Academy of Child & Adolescent Psychiatry. The research, involving 84 children, was conducted as part of a larger study of clinical depression in children ages 3 to 7. The principal investigators of that larger study, which includes therapy and functional brain scanning, are Luby and Deanna M. Barch, PhD, chair of Washington University’s Department of Psychological & Brain Sciences in Arts & Sciences and the Gregory B. Couch Professor of Psychiatry at the School of Medicine. The children wore a device that resembles a shower cap but is hooked to wires that measure electrical activity in the brain using an electroencephalogram machine (EEG). Then, the children played a computer game that involved choosing between two doors shown on the screen. Choosing one door won them points, but choosing the other resulted in a loss of points. Researchers have tested this idea in adults and teens by allowing them to win cash. In this study, however, young children who picked the correct door enough times won a toy that they were able to pick from a basket of figures, balls and plush items they had been shown before the computer session began. 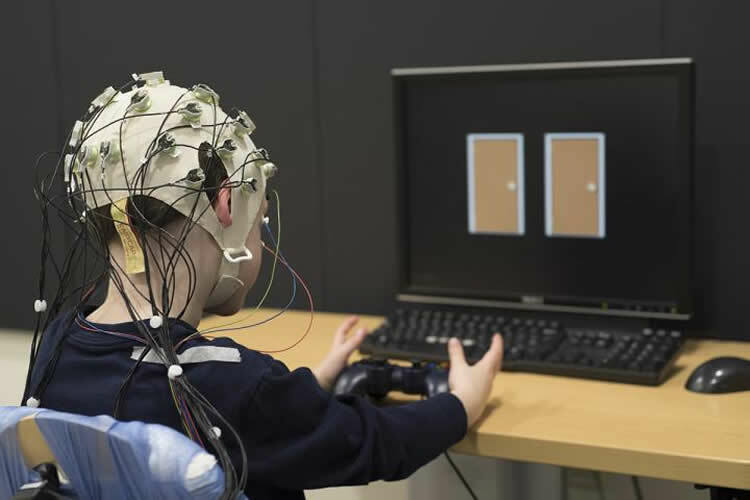 A child wearing a device that measures electrical activity in the brain chooses between doors on a computer screen. Choosing one door wins points while the other results in a loss of points. Washington University researchers have found that the brains of children with depression don’t react as robustly to success in the game. Their blunted reward response is a marker of clinical depression. NeuroscienceNews image is credited to Robert Boston. Luby and Belden said that when a very young child doesn’t seem to be excited by rewards, such as toys and gifts, it may be a sign that the child is depressed or prone to depression. If the condition persists, they suggest parents talk to a pediatrician. Funding: This work was supported by the National Institute of Mental Health of the National Institutes of Health (NIH), grant numbers 1R01 MH098454-01A1 and 3R01 MH098454-03S1. Dr. Luby has received royalties from Guilford Press. Dr. Barch has served as a consultant for Pfizer, Amgen, Roche and Takeda and has a contract to analyze imaging date from Pfizer. Image Source: NeuroscienceNews.com image is credited to Robert Boston. WUSTL. “Depressed Children Respond Differently to Rewards Than Other Kids.” NeuroscienceNews. NeuroscienceNews, 15 December 2016. WUSTL. “Depressed Children Respond Differently to Rewards Than Other Kids.” http://neurosciencenews.com/reward-teen-depression-5753/ (accessed December 15, 2016). Adults and adolescents with major depressive disorder (MDD) show a blunted neural response to rewards. Depression has been validated in children as young as age 3; however, it remains unclear whether blunted response to reward is also a core feature of preschool-onset depression. If so, this would provide further validation for the continuity of the neural correlates of depression across the life span and would identify a potential target for treatment in young children. Fifty-three 4- to 7-year-old children with depression and 25 psychiatrically healthy 4- to 7-year-old children completed a simple guessing task in which points could be won or lost on each trial while event-related potentials (ERPs) were recorded. Psychiatric diagnosis was established using a preschool version of the Kiddie Schedule for Affective Disorders and Depression. Young children with depression showed a reduced differentiation between response to gains and losses, and this finding was driven by a blunted response to reward (i.e., the reward positivity [RewP]). These findings held even when controlling for co-occurring attention-deficit/hyperactivity disorder, oppositional defiant disorder, and generalized anxiety disorder. The RewP did not vary as a function of depression severity within the group with depression. Similar to adults and adolescents with depression, preschoolers with depression display reductions in responsivity to rewards as indexed by the RewP. These findings provide further evidence for continuity in the neural mechanisms associated with depression across the lifespan, and point to altered reward sensitivity as an early-emerging potential target for intervention in preschool-onset depression. One of the hallmarks of clinical depression, either in children or adults, is ‘too much dopamine in the brain’. Naturally, any additional ‘expected euphoria’ (dopamine increase) would be blunted because the brain is already in a state of ‘over=stimulation’. I’m curious as to ‘how these researchers intend to treat these depressed children, to lower their dopamine levels. Please don’t use ECT or anti-psychotics, as their is a better way.